Enjoy your vacation from the center of Vail Village in this Solaris residence, a vacation condo that fits more like a home. 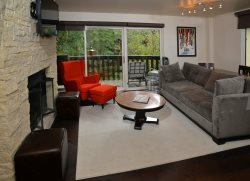 Perfect for family and small groups, this Vail vacation condo / residence offers scenic views and proximity to the best Vail has to offer. Enjoy this Solaris vacation rental that includes a den that can accommodate up to six people. Solaris residences are available for premium accommodations and services at an ideal location in the center of Vail Village. It has 24 hour desk services and offers customize holiday packages with a personal assistant program. They are there to arrange and coordinate individual and family needs; from spa and restaurant reservation, summer and winter vacation packages and shuttle services. Solaris is located at the heart of Vail Village, just steps from the ski lift and offers a five-star accommodations and amenities. Solaris residences cater to people who wants to be pampered. It provides fitness facility, heated indoor pool and hot tub, heated underground parking, laundry service, and twice daily housekeeping. It surroundings include ice skating rink, bowling alley, movie theater, and shopping and dining. Their valet and bell desk provides slope-side ski valet and ski lockers at Gondola 1. Family-friendly activities at Bol, a posh hot spot for bowling and dining. Another is Cine Bistro, a modernistic movie theater with service of dinner and cocktails delivered to your seat. Furthermore, Matsuhisa is where foodies and other can relax and dine creative appetizing dishes; where sushi is an art form. All residential properties are fully furnished and the lay out consist of stone fire place, hardwood floors, cherry finished doors, deluxe kitchen and posh baths. Living space of 1850 square feet is perfect for large family. It has a sunny Mountain View master suite with a king bed. A full second bedroom with a queen bed. A private den with twin bunk beds and a bathroom. Spacious living space is an ideal for social entertaining or luxurious comfort for you family. Stay here for a unique Vail vacation experience.